The UK will publish BoE Quarterly Bulletin and the US will release Markit Composite PMI Flash and Markit Manufacturing PMI Flash. 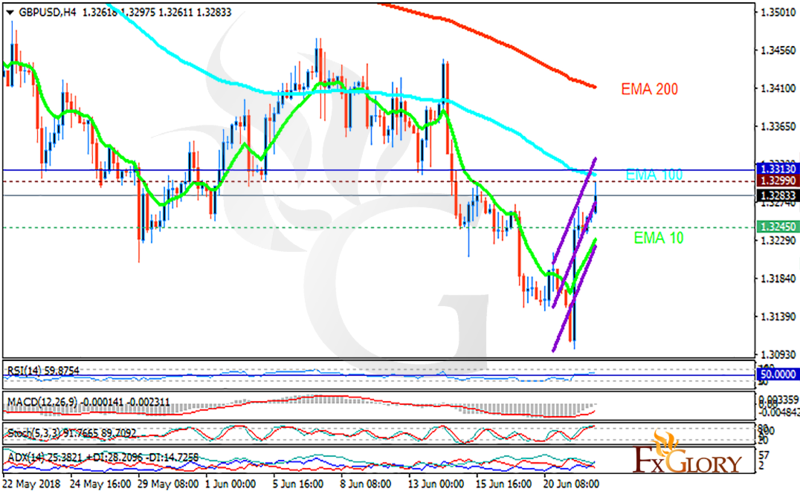 The support rests at 1.32450 with resistance at 1.32990 which both lines are below the weekly pivot point at 1.33130. The EMA of 10 is moving with bullish bias in the ascendant channel and it is below the EMA of 200 and the EMA of 100. The RSI is moving above the 50 level, the Stochastic is moving in high ranges and MACD is in the neutral territory. The ADX is showing buy signal. Despite GBP attempt to rise, it does not seem that the price reaches 1.335. Bears will continue their control over the chart and push the price down towards 1.31.